Bullet, RPM, Kent, Crown, ABC-Paramount, MCA, Geffen etc. B.B. King, born Riley B. King (September 16, 1925 - May 14, 2015), was an American blues guitarist, singer, and songwriter, widely considered one of the greatest blues guitarists of all time. King had a a large number of hits in the R&B market in the 1950s and early 1960s, including such blues classics as "Sweet Little Angel," "Everyday I Have the Blues," and "Sweet Sixteen." In 1968 he broke into the mainstream with "Thrill Is Gone," which reached number three on the pop charts and won a Grammy Award for Best Male R&B Vocal Performance. King's virtuoso guitar style strongly influenced the new generation of rock and blues guitarists, such as Eric Clapton, Jimi Hendrix, Stevie Ray Vaughn, and many others. He is the recipient of numerous awards, including the Presidential Medal of Freedom and the National Heritage Fellowship of the National Endowment for the Arts. A vegetarian and abstainer from alcohol, King was also a prominent spokesman for diabetes awareness and treatment. He was inducted into the Rock & Roll Hall of Fame in 1987, one of the first artists to be honored by the museum. Riley B. King was born on a cotton plantation in rural Mississippi in 1925. One of five children, he moved with his mother to the town of Kilmichael after his parents separated and lived with his grandmother after his mother's death in 1935. He sang gospel music in church learned and the rudiments of the guitar from a preacher. As a teenager, King sang in a gospel group called the Elkhorn Jubilee Singers but also listened to blues music by singers such as Lonnie Johnson and Blind Lemon Jefferson. King reported that he intended on a career in gospel music. A licensed pilot, B. B. King was also a vegetarian, non-drinker, and non-smoker, but admitted to gambling. Delta blues artist Bukka White was King's first cousin, and former heavyweight boxing champion Sonny Liston was his uncle. His favorite singer was Frank Sinatra, whom he cited as a significant influence in his timing and delivery. King has also credited Sinatra for opening doors to black entertainers who were not given the chance to play in "white dominated" venues, including helping King get into main Las Vegas venues during the 1960s. King was married twice, to Martha Lee Denton, 1946 to 1952, and to Sue Carol Hall, 1958 to 1966. The failure of both marriages has been attributed to the heavy demands made on the marriage by King's 250 performances a year. King lived with Type II Diabetes for over 20 years and was a prominent spokesman in the fight against the disease, appearing in advertisements for diabetes-management products. After the cancellation of the remaining eight shows of his 2014 tour because of health problems, King announced on October 8, 2014, he was back at home to recuperate. On May 1, 2015, after two hospitalizations caused by complications from high blood pressure and diabetes, King announced on his website that he was in hospice care at his home in Las Vegas, Nevada. He died in his sleep on May 14, 2015. After being inducted into the army at age 18, King served locally and was able to hear live performances in Indianola, Mississippi by such diverse performers as Robert Nighthawk, Duke Ellington, Count Basie, Sonny Boy Williamson, and Robert Jr. Lockwood. Meanwhile, he started a new gospel group, the Famous St. John Gospel Singers, and played his guitar for tips in Indianola. After World War II ended and King was released from the army, he traveled to Memphis, Tennessee, where his cousin, Delta bluesman Bukka White, lived. King and White played amateur performances, but King went back to Indianola after ten months. There he worked to develop his skills, and returned to Memphis two years later. In addition to Delta bluesmen like White, King was also influenced by the recordings of a range of more citified guitarists, from bluesman T-Bone Walker to jazz players like Django Reinhardt and Charlie Christian. As a singer, besides his gospel and traditional blues roots, he cites Frank Sinatra as a major influence, who helped him add a sophisticated touch to his timing and delivery of the blues forms. When he returned to Memphis, King initially worked at the local R&B radio channel WDIA as a singer. 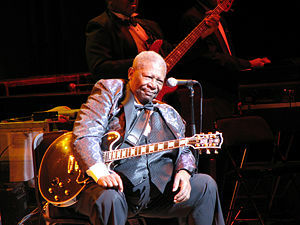 He also gained a reputation as an impressive young guitarist, playing in Beale Street blues clubs and collaborating with such singers as Bobby "Blue" Bland. King also worked as a disc jockey, where he gained the nickname "Beale Street Blues Boy," later shortened to "B.B." B. B. King in concert in France. King debuted as a recording artist on Bullet Records, issuing the single "Miss Martha King" (1949), which received a bad review in Billboard magazine and did not chart well. Later that year, he began recording songs under contract with Los Angeles-based RPM Records, also recording for its Kent and Crown affiliates. In the 1950s, King became one of the most important names in R&B music. His first hit was his slow 12-bar blues classic “Three O’Clock Blues,” which reached the top of rhythm & blues chart in 1951, for five weeks. It remains today one of the great examples of perfectly combined blues singing and lead guitar playing. King amassed an impressive list of other hits including the R & B chart-toppers "You Upset Me Baby," "You Know I Love You," and "Please Love Me." Other blues classics recorded by King during this period included "When My Heart Beats like a Hammer," "Every Day I Have the Blues," "Sweet Little Angel," and others. In 1962, King signed to ABC-Paramount Records, which was later absorbed into MCA Records. Enjoying his new contract's guarantee of larger royalties, he scored major R&B hits, including his signature "Sweet Sixteen," and "Don't Answer the Door," both of which reached number two on the R&B chart. His 1965 Live at the Regal LP is considered a classic concert album, which captures the dynamic interplay between the masterful King and his enthusiastic black audience. In the later 1960s, King began to attract the attention of white blues fans, who particularly appreciated his guitar work. Top rock and blues guitarists like Mike Bloomfield, Eric Clapton, Jimi Hendrix, and others credited him has a major influence, expanding his album sales to a wider audience. King's first major success outside the blues market was his 1969 remake of Roy Hawkins' tune "The Thrill Is Gone." King's version became a hit on both pop and R&B charts, which was rare at the time for a blues artist. The record won a Grammy and later gained the number 193 spot in Rolling Stone's Top 500 Songs Of All Time. King won further rock visibility as an opening act on The Rolling Stones 1969 American Tour. His mainstream success continued throughout the 1970s, with songs like "To Know You Is to Love You" and "I Like to Live the Love." By the 1980s, King had become a blues legend and was much in demand as a concert artist. The 80s, 90s, and 2000s saw him recording less, but throughout this time he maintained a highly visible and active career, appearing on various television shows and performing live concerts 300 nights a year. He also received numerous prestigious awards, from Grammy Awards, to honorary doctorates, and the Presidential Medal of Freedom. In 1988, King reached a new generation of fans with the single “When Love Comes To Town,” a collaborative effort between King and the Irish band U2 on their Rattle and Hum album. In the same year, he appeared in feature film The Blues Brothers 2000, playing the part of the lead singer of the Louisiana Gator Boys, along with Eric Clapton, Dr. John, Koko Taylor, and Bo Diddley. In 2000, King teamed up with guitarist Eric Clapton to record Riding With the King. In 2003, he shared the stage with the rock band Phish in New Jersey, performing three of his classics and jamming with the band for over 45 minutes. He also made an appearance at the Crossroads Guitar Festival organized by Eric Clapton. On the DVD version of the event, he plays "Paying The Cost To Be The Boss" and "Rock Me Baby" with Robert Cray, Jimmie Vaughan, and Hubert Sumlin. On March 29, 2006, King played at England's Sheffield's Hallam Arena, the first date of his UK and European farewell tour. The British leg of the tour ended on April 4 with a final UK concert at Wembley Arena. He returned to Europe in July, playing twice in the fortieth edition of the Montreux Jazz Festival. He also appeared in Zürich at the Blues at Sunset on July 14. In November and December, King played six times in Brazil. During a press conference on November 29, in São Paulo, a journalist asked King if that would be the "actual" farewell tour. He answered: "One of my favorite actors is a man from Scotland named Sean Connery. Most of you know him as James Bond, 007. He made a movie called "Never Say Never Again." On July 28, 2007, B.B. King Played again at Eric Clapton's Crossroads Guitar Festival with 20 other guitarists to raise money for the Crossroads Center, Antigua, for addictive disorders. As of late 2008, King was still touring energetically in the United Sates. His album One Kind Favor, released in August 2008, was hailed by Rolling Stone magazine as "B.B. King's best album in years… [and] one of the strongest studio sets of his career." In a career lasting well over 50 years, B. B. King played at least 15,000 performances. His virtuoso guitar stylings have influenced subsequent generations of blues and rock guitarists probably more than any other single player. Often underestimated as a singer because of his prodigious talent on the guitar, King left a corpus of powerful, yet sensitively nuanced blues vocal performances that is perhaps unequaled. One of King's trademarks was "Lucille," the name he gave to his guitars since the 1950s. He gave his guitar this name after escaping from a club fire which was started during a fight over a woman named Lucille. When King escaped the club, he realized that he had left his guitar in the building and ran back inside to get it. He named his guitar "Lucille" to remind himself never to behave so recklessly again. King reached millions through his appearances on television, making guest appearances in numerous popular shows, including The Cosby Show, The Young and the Restless, General Hospital, The Fresh Prince of Bel-Air, Sesame Street, Married With Children, and Sanford and Son. He is the subject of several biographies, including B.B. King: There is Always One More Time, by the noted New York-based music writer David McGee. King was associated with three B.B. 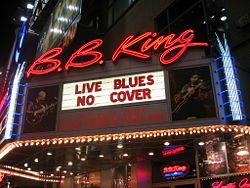 King Blues Clubs in Memphis, Orlando, and Nashville, and the B.B. King Blues Club & Grill, Lucille Cafe in New York City. In June 2006, King was present to memorialize his first radio broadcast at the Three Deuces Building in Greenwood, Mississippi, where an official marker of the Mississippi Blues Trail was erected. In the same year, a groundbreaking was held for a new B. B. King Museum and Delta Interpretive Center in Indianola, Mississippi, which was scheduled to open in 2008. King won 15 Grammy Awards, of which ten were for Best Traditional Blues Album. In 1971, he won the Grammy for Best Male R&B Vocal Performance (for "The Thrill is Gone"), which also garnered a Grammy Hall of Fame Award in 1998. 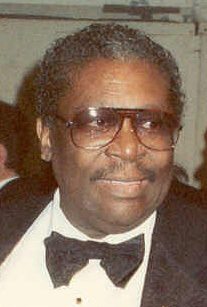 King was given a Grammy Lifetime Achievement Award in 1987. 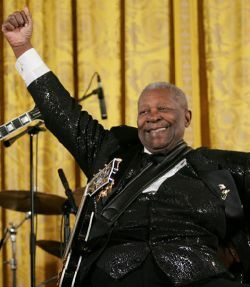 King was officially inducted into the Blues Hall of Fame in 1980 and into the Rock & Roll Hall of Fame in 1987, becoming one of the first artists to be honored by the museum. He was awarded the National Medal of Arts in 1990. In 1991, he was presented the National Heritage Fellowship from the National Endowment for the Arts. King was recognized at the Kennedy Center Honors in 1995 for "the lifelong accomplishments and extraordinary talents of our Nation's most prestigious artists." In 2004, he was presented an honorary Ph.D from the University of Mississippi, and the Royal Swedish Academy of Music awarded him the Polar Music Prize for his "significant contributions to the blues." On May 14, 2008, King was presented with the keys to the city of Utica, New York; and on May 18, 2008, the mayor of Portland, Maine, Edward Suslovic, declared the day "B.B. King Day" in the city. Prior to King's performance at the Merrill Auditorium, Suslovic presented King with the keys to the city. Also in 2008, Mississippi honored one of its favorite sons with the opening of the elaborate B.B. King Museum and Delta Interpretive Center in Indianola. In 2009, Time named B.B. King No.3 on its list of the 10 best electric guitarists. "Story from My Heart and Soul"
"When My Heart Beats Like a Hammer"
↑ British Hit Singles & Albums 19th Edition (HIT Entertainment, 2006, ISBN 1904994105). ↑ "Everyday I Have the Blues" was the b-side to "Sneaking Around." ↑ "Ten Long Years" was the b-side to "What Can I Do (Just Sing the Blues)." ↑ "Bad Luck" was the b-side to "Sweet Little Angel." ↑ "Troubles, Troubles, Troubles" was the b-side to "I Want to Get Married." ↑ "Be Careful with a Fool" was the b-side to "(I'm Gonna) Quit My Baby." ↑ "You've Been an Angel" was the b-side to "Please Accept My Love." ↑ "Peace of Mind" was the b-side of "Someday Baby." ↑ 9.0 9.1 9.2 9.3 Billboard Magazine did not publish an R&B Singles chart between November 1963 and January 1965. ↑ "You Put It On Me" was the b-side of "The B.B. Jones." ↑ "Get Off My Back Woman" was the b-side of "I Want You So Bad." ↑ "Friends" was the b-side of "My Song." ↑ "When Love Comes to Town" was the first B. B. King single to chart on Billboard's Mainstream Rock Tracks chart. Danchin, Sebastian. Blues Boy: The Life and Music of B.B. King. Jackson: University Press of Mississippi, 1998. ISBN 9781578060177. King, B. B., and David Ritz. Blues All Around Me: The Autobiography of B.B. King. New York: Avon Books, 1996. ISBN 9780380807604. McGee, David. B. B. King: There Is Always One More Time. San Francisco: Backbeat Books, 2005. ISBN 9780879308438. Sawyer, Charles. The Arrival of B. B. King: The Authorized Biography. Garden City, N.Y.: Doubleday, 1980. ISBN 9780385159296. History of "B. B. King"
This page was last modified on 8 December 2016, at 23:56.